Over the course of the years, video games have become more and more complicated, making it impossible, at times, to enjoy some of them without having to invest a considerable amount of time and energy. If nostalgia for the glory days of the arcades has gotten hold of you of late, where only high scores and skill mattered, Housemarque has the perfect cure for you, a cure called Nex Machina. Nex Machina is, effectively, an arcade game from the late 80s, early 90s, with a modern skin and some features that allow players to enjoy the game in different ways. There’s no story to follow, no character to level up, no other RPG-influenced sub-system. Just shoot, survive and watch those points rack up. To be honest, Nex Machina does have a story, but it’s almost completely irrelevant. In the game’s world, humans have become too dependent on technology, while machines have surpassed their original functions to obtain consciousness and superior intelligence. Like in any proper dystopic world, the machines decide that it’s time to get rid of the humans for good, and the player is the last stalwart against them. Did you really want a reason to obliterate hordes of machines? If so, you got it. Nex Machina’s gameplay takes quite a bit from other twin stick shooters developed by Housemarque, such as Dead Nation and Alienation. Players control their character with the left stick while shooting with the right, dashing with the left trigger and activate a secondary weapon with the right. Each of the game’s worlds is divided into 15 different closed zones, where players have to get rid of all of the machines to proceed. Making the whole ordeal varied are the good variety of enemies, all coming with different attack patterns and the fact that players need to rescue humans in each of the world’s zones to further increase their score multiplier, something that’s incredibly important in a game that puts quite a bit of emphasis on achieving scores higher than the ones achieved by other players. At the end of each world are also some hectic boss battles where players need to put to use everything they have learned during the course of the world. Despite being a rather straightforward arcade game, there’s quite a bit of depth in Nex Machina, especially if players want to climb the leaderboards. For starters, learning the enemies’ patterns and attacks is incredibly important, as the playable character needs only one hit to die, not counting the Shield power-up. Secondly, the score multiplier gets reduced with each life lost, and one of the obtained power-ups will be dropped, forcing players to get it back. Considering how important power-ups are in the game, especially the secondary weapons, not dying is always the way to go, as the game doesn’t pull any punches even on the Rookie difficulty mode. Sure, you get unlimited continues, but what’s the point if you end up at the bottom of the leaderboards? Completing Nex Machina’s arcade mode is only the beginning, as the game comes with some interesting play modes which extend the game further. Not only players can enjoy completing arcade mode together with another player in local co-op, they can also challenge themselves further by ramping up the main mode’s difficulty. The Veteran and Master difficulties not only greatly limit the number of continues, but also increase the overall speed of the game. And in case all this isn’t enough, players can take on the Arena mode, where they are rewarded for completing specific challenges, such as obtaining a high score in each of the game’s worlds and more. By completing the Arena mode’s challenges, players are awarded medals which increase their rank and allow them to customize their profile, a little touch of modernity that definitely doesn’t hurt. And if the player wants to improve his or her performance in a specific world, they can do so thanks to the Single World mode. Achievements fanatics will also be happy to learn that the game has a specific Feats system which rewards them for completing specific tasks. 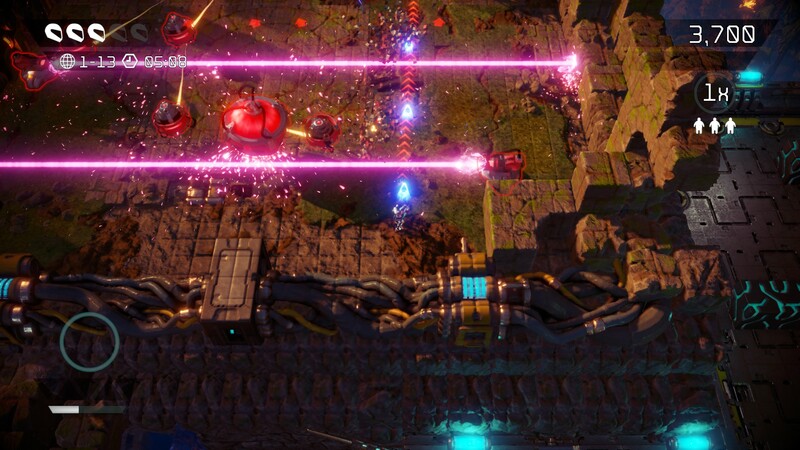 Nex Machina doesn’t just play great, but it also looks quite nice. 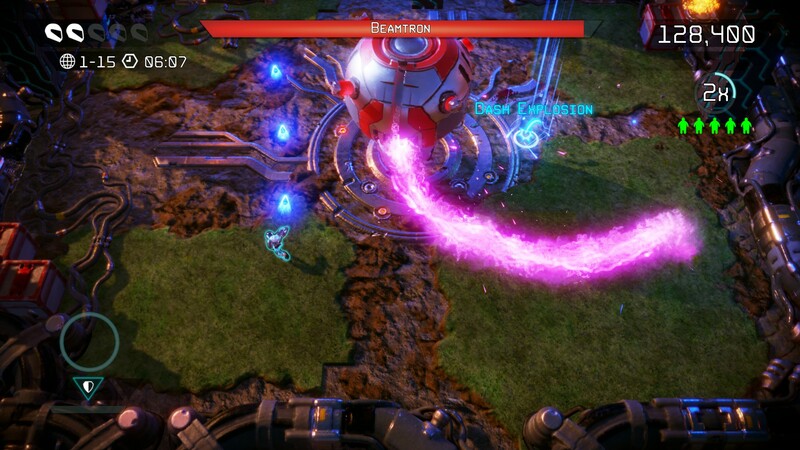 Like in other Housemarque games, the screen gets filled with a huge number of enemies, flashy explosions and special effects as soon as the action starts, and none of this impacts performance. Especially remarkable are the environment morphing effects, which look great in motion. The PC version of the game, specifically, doesn’t suffer from any performance issue, keeping a steady frame rate on a system featuring an i7-3770 CPU, GTX 980 Ti GPU and 16 GB RAM. As the recommended specs are lower than these, Nex Machina should run well on most modern systems. In a world filled with games featuring a multitude of sub-system and mechanics, Nex Machina feels like a breath of fresh air. The game itself might be short, but the huge amount of depth and the varied game modes make it a game that no fans of twin-stick shooters and fast paced arcade games should miss. PC version tested (review code provided by the publisher). You can get the official soundtrack via Amazon. Nex Machina manages to tribute arcade games of the past such as Robotron and Smash TV without relying on nostalgia alone, offering a deep experience that doesn't require sub-systems to please players with a strong competitive attitude. As the experience is mostly geared towards getting the highest possible score, however, some players might find the game too short, as the main Arcade mode takes very little time to complete. As such, Nex Machina is not a game for everybody. All those who enjoy the genre, however, should definitely give it a spin.